The library bookstore where I volunteer recently received a donation of very old shorthand books. A question was asked about keeping them or not, since few people learn shorthand these days. While a collector might grab them, I had another reason for wanting them put out for sale. I would have purchased something like this when my son was young – it might have become a pretend spy or detective book! My son and his friends were always looking for accessories that would make their play more fun. What could be better than a secret code book that no one could read? I love seeing how children use things in their play. 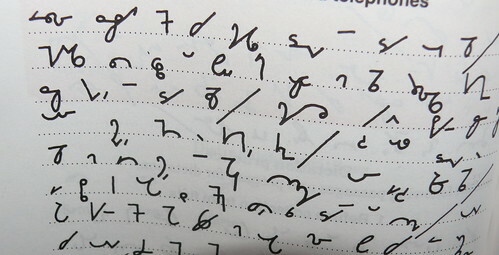 What would kids do with a book full of shorthand markings if it was explained that people used to use it to write notes quickly? Would it inspire them to try something on their own? Other things I see at our library that would have been exciting for my child are old Thomas Guides and atlases, and engineering and architect books. Real books used by real professionals in all fields. There’s something about being authentic that is very fun for a child. If you look at what is in a used bookstore or thrift shop with an open mind, all sorts of treasures become apparent. Keep an eye out for things that might be used in an entirely new way as part of child’s imaginative play. There are many real life items that kids love. There are flashlights, rolls of caution tape, signs (stop, keep out, etc. ), free things from work or conferences, and items you no longer need. They aren’t your typical toys, but your child may find a creative use! Written by Karen Taylor, posted on 26 June 2012 at 9:15 am, and filed under Homeschooling, Learning Ideas. Bookmark the permalink.